UPDATED 2 p.m. Monday, March 18 - Phoemala Miranda has been safely located. After going missing from last night, the search for a 9-year old Elk Grove girls has expanded. 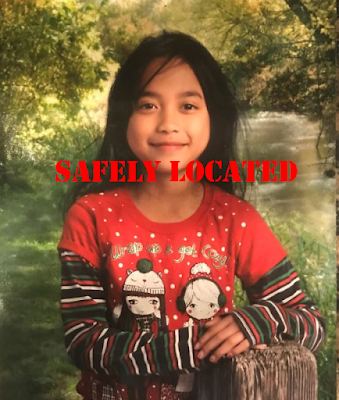 According to information posted to their Twitter feed, the Elk Grove Police Department is now searching for the missing child with the help of Sacramento Police's helicopter and further assistance from Galt Police. The search for Phoemela Miranda has been expanded to the area west of Highway 99. With the assistance of Elk Grove/ Galt CERT and @SacPolice air unit, we will be searching west of Hwy 99 for Phoemela Miranda. She was last seen wearing a gray shirt and gray leggings. Anyone with info regarding the whereabouts of Phoemela Miranda is asked to us (916) 691-5246. She was last seen wearing a gray shirt and gray leggings. Phoemela went missing on the late afternoon of Sunday, March 17 after a disagreement with her parents. Anyone with info regarding the whereabouts of Phoemela Miranda is asked to us (916) 691-5246.